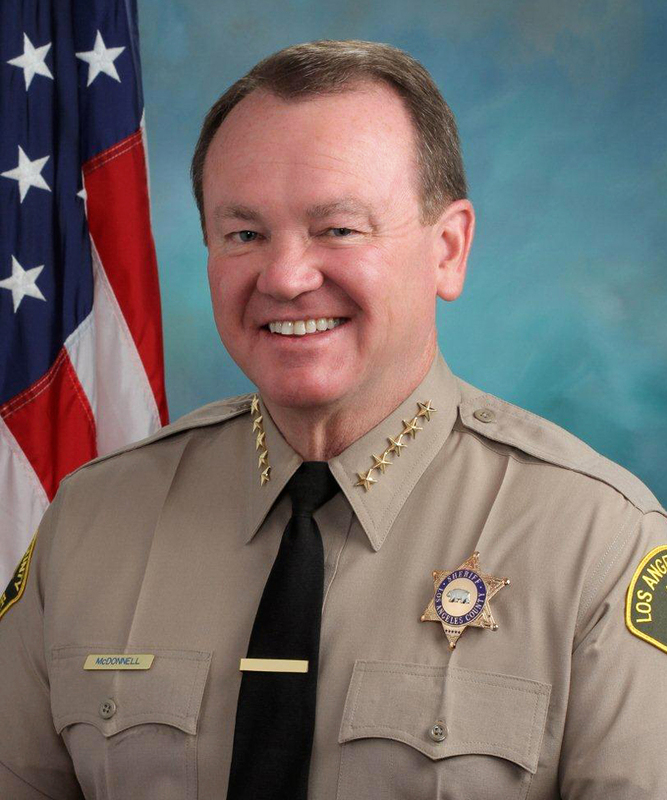 [LASD 2014] — On Dec. 1, 2014, Jim McDonnell took the oath of office and was sworn in as the 32nd Sheriff of Los Angeles County. Sheriff McDonnell is a Boston native who grew up in a working class neighborhood a stone's throw from Fenway Park. He came to Los Angeles over three decades ago with little more than a dream to be part of protecting and serving the public. He was born to immigrant parents who instilled in him the values that have served as the guideposts throughout his life: hard work, integrity and treating all people with respect. He began his law enforcement career in 1981 as a twenty-two-year-old graduate from the Los Angeles Police Academy. Sheriff McDonnell served for 29 years at the Los Angeles Police Department, where he held every rank from Police Officer to second-in-command under Chief Bill Bratton. During his time at the LAPD, he earned that Department's highest honor for bravery, the Medal of Valor, and led LAPD through the implementation of significant reforms. He helped create the blueprint for LAPD's community-based policing efforts that have now become a model for law enforcement agencies throughout the nation. For five years, Sheriff McDonnell served as the Chief of the Long Beach Police Department. In that role, he implemented numerous improvements that resulted in safer communities, increased morale, and enhanced community relations. From his first day on the job, Sheriff McDonnell has stressed the importance of treating all members of our community with respect, being transparent with and accountable to the individuals that the LASD serves, and creating an environment that recognizes and rewards character, competence and compassion. He is committed to ensuring that safe streets and neighborhoods enable all residents and businesses in L.A.'s diverse County to thrive. He is also a believer in prevention-oriented strategies and dedicated to proactively addressing the root causes of crime — including mental illness, homelessness and the challenges facing youth at risk. Sheriff McDonnell brings to the LASD decades of experience and strong relationships with law enforcement and government leaders. He is a proven and respected voice in local, state, and national criminal justice organizations, having served as President of the Los Angeles County Police Chiefs' Association, President of the California Peace Officers' Association, a member (appointed by both Governor Brown and Governor Schwarzenegger) of the California Commission on Peace Officers' Standards & Training (POST), and a board member of the Peace Officers' Association of Los Angeles County. LASD during his service as a member of the Citizens' Commission on Jail Violence — a blue ribbon group created by the County Board of Supervisors to investigate the validity and causes of allegations of excessive force within the LASD's Custody Division. The Commission issued a detailed report, including 63 recommendations that have become a roadmap for change within the Department. Sheriff McDonnell is also a believer in the importance of education, both in the classroom and on the job. He holds a Bachelor of Science degree in Criminal Justice from St. Anselm College in Manchester, New Hampshire and a Master's Degree in Public Administration from the University of Southern California. He is also a graduate of the Federal Bureau of Investigation's National Executive Institute and has completed executive education programs at Harvard's Kennedy School of Government. He and his wife Kathy live in Long Beach. He has two daughters — Kelly who is in law school and Megan pursuing a graduate degree in film school.